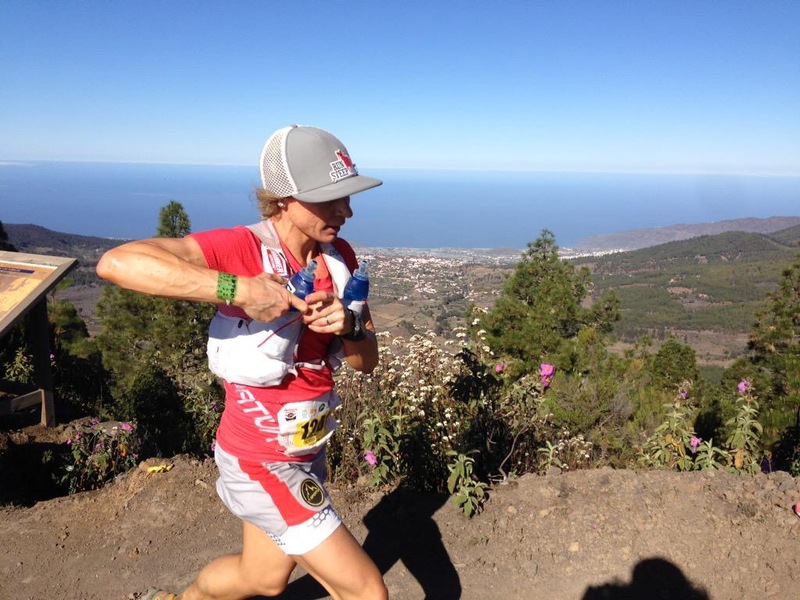 Transvulcania 73.3k ultramarathon is the first race of the 2015 Skyrunning World Series. The race takes place on La Palma, one of the Spanish Canary Islands. 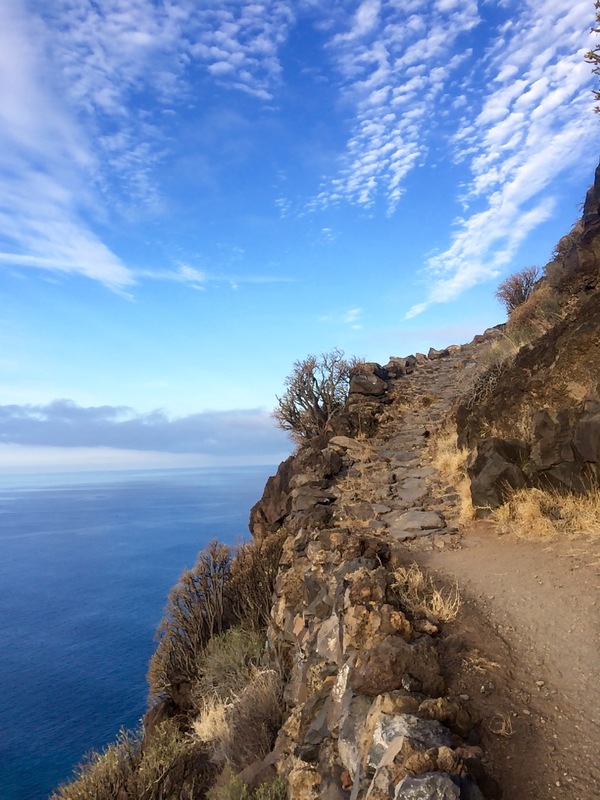 Runners follow the volcanic ridge of the island from the southernmost coast at Fuencaliente, north to the high point at Roque de los Muchachos, before dropping down to the west coast town of Tazacorte and finally climbing back inland to finish at Los Llanos de Aridane. 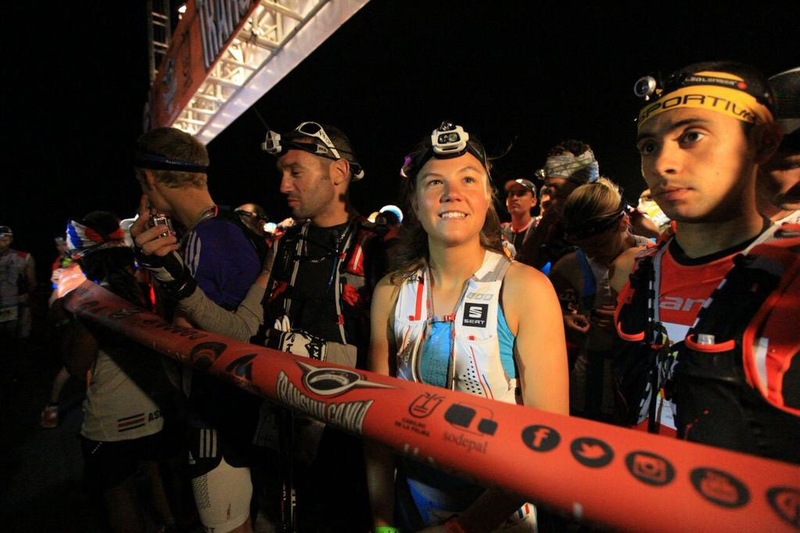 Transvulcania starts in the heavy dark folds of morning by the lighthouse at Fuencaliente. Tour buses release runners into whipping coastal winds. 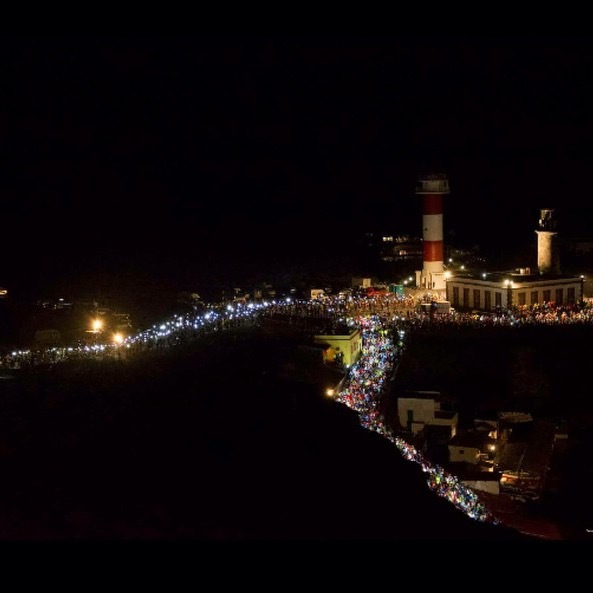 A thick ribbon of about 2000 headlights glows uphill toward the illuminated archway at the start line. Near the front, Jason Schlarb and Paul Hamilton of Colorado stood near me on the left edge of the mass. Former champions Dakota Jones, Emelie Forseberg, and Luis Alberto Hernandez line up front and center. The initial starting rush is frantically cutthroat. Runners elbow and push to get to the front of the ensuing bottleneck as the path narrows quickly to a two-person width. Trekking poles flail about, clanging off the rocks. Deep sand complicates footing, slowing the crowd. For ten miles the course climbs consistently up nearly 6000 vertical feet. 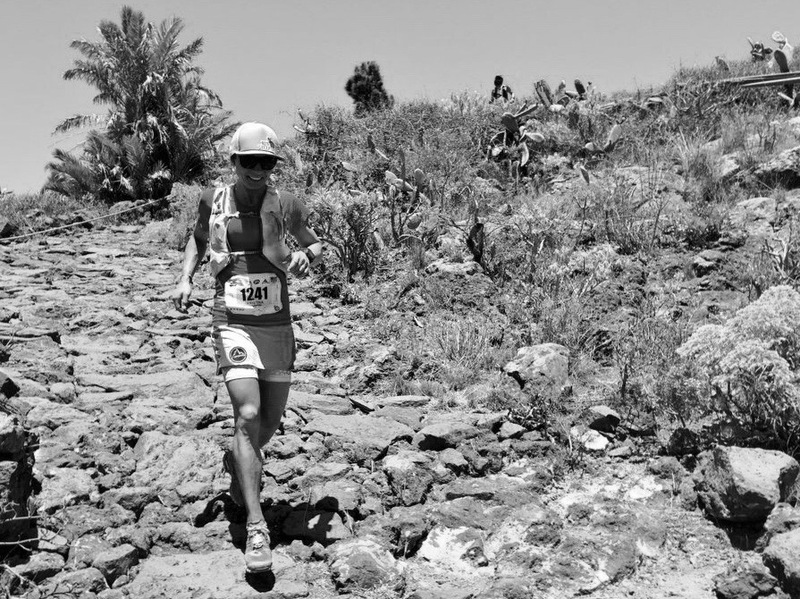 Leaving Los Canarios, runners follow the sandy path, entering a pine forest growing from decomposing volcanic rock. Prime views of the sunrise reveal orange beams shining magnificently over a thick puffy blanket of endless white clouds. Diffused through the airborne dust, the glow is fire between pines. Sleepy feet shuffle along without haste. Surrounding me were only men. Disappointingly, I see no other women for the rest of the day, and there is no desperation. Instead, I find a steady rhythm shouldering past men who are reluctant to move aside as they walk the uphills, then moving aside for them to blaze the downhills, their arms winging out, feet slipping. Repeatedly, I catch them within minutes on the next uphill. As the day warms, I avoid risking overexertion. The sand and rocky climbs are challenging and the heat demands my attention. Pre-race advice from home reiterated running “smart, steady and strong.” For the first twenty miles I must be patient, running my own race. The next ten would be the crux in the heat of the day, without any aid stations. 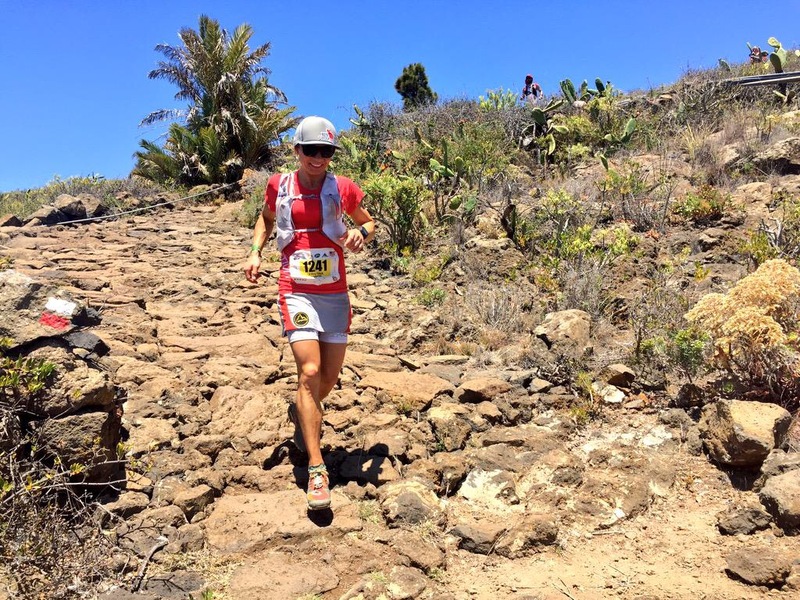 Finally, after the last push to the high-point of the race, Roque de los Muchachos, we would descend 7800-feet in eleven miles over notoriously technical terrain to the ocean, before a final three mile, 1000-foot climb to the finish. The last descent and climb were rumored to be two of the most difficult parts of the race, demanding strength and focus. The next aid station, El Pilar, is another spectacle. Celebrations engulf the street. Again, there is loud music, blaring speakers, and television cameras. Nothing like this exists in US ultrarunning outside of perhaps Foresthill at Western States. Energy reverberates through the woods for several kilometers. Nearing the aid station, I was pleasantly surprised to see Meghan Hicks reporting for iRunFar. She would remain the only spectator on the entire course who I would recognize from America. After twenty miles, nearing the heat of the day, we emerge into the intense sun. For the next ten miles we will climb the last of the steep serrated teeth of the ridge. At my pace, there will be no aid for over two hours so I have to move calmly, rationing my water. Staving off dehydration is a battle, and I must fight hard to lose it slowly. Soon, I am parched. I know this far into the game I cannot overcome this deep of dehydration. It gnaws at me. I keep handling my collapsible bottles trying to eek out another sip but the water is gone. I swallow dryly. I feel my feet shuffling and my stamina flagging. At the crest of each climb are strings of jubilant spectators with umbrellas and coolers. The next aid is close but still three miles which will take me over a half hour. I try to pick up my feet on flatter sections and drive my knees forward. But at some point, my foot catches, and I fall hard, driving a rock into my hip and scuffing my hands. The hip aches as I stand to run. Dizziness makes it difficult to focus on forward motion. I have to stop eating because there is no water to wash it down. At mile 30 aid, I rapidly take in several cups of water. My stomach sloshes during the next piece of trail, the final climb to Roque de los Muchachos, and a spectator tells me I am sixth female. The next woman is ten-minutes ahead. It is less than two miles, but the trail is jagged and narrow, covered in loose grapeshot and baseball sized ankle-breakers. Stoney steps wind threateningly above the steep cliffs. The running is abrupt and ungraceful. I drink nearly a half liter in this short section, but still the land is like an oven, cooking my blood to sludge. The sun is beating down, burning my neck and arms. Radiating heat from the dusty earth feels like a warming fire wafting in my face and penetrating the soles of my shoes. My progress is heartbreakingly slow. I try not to think about my time or the heat and focus hard on running my best. But the views on the horizon are surreal. Impossibly steep ridges pierce through the ground far below, covered in ruffled layers of pine forest. Relics of black lava flows wind through deep slots between the towering promontories. The sky is bright azure and the sea at far is deep, rich cobalt. I remain in complete awe of this amazing place, feeling incredibly grateful for the opportunity to run here. Nearing Roque, colorful crowds sprinkle reddish-brown crags like candy in dirt. Helicopters and drones buzz around the sky. The atmosphere is refreshingly distracting. The aid tent is crowded and hectic. A volunteer asks perfunctorily to see my mandatory gear, while another volunteer gropes at my pockets. Oh god, I think, this race will take all day. They are quick about it though, and I embark on the descent, bottles awkwardly full and stomach sloshing. This is where I should run faster. Advice from home haunts my thoughts urging me to push here. But fighting makes the trail more offensive. I force myself to acknowledge that sixth place is a very good position for my first international race in this deep field of strong women. I will have other races to take risks, but this is not the one. I came too far to risk failure, even if it means disappointing my peers. I hold back playing it safe, and work carefully downward. As the day progresses, the spectators get more rowdy. Teenage girls cry out, pointing gleefully at Tim Olsen. Partiers offer beer and watermelon. Their enthusiasm for celebration is comical, but my body finds the volcanic desert island inhospitable. I struggle to keep eating and drinking. I find though it easy enough to smile. The trail through El Time becomes a mixture of smoothed undulating lava, polished and uneven cobbled rocks, and slippery gravel. There is no purchase and very little comfortable running. For thousands of feet we descend until we break out of the woods into the sprawling homes along the west coast of the island just north of the oceanside town, Tazacorte. The beach and water below look so inviting, but here the smell of cat piss hangs in the air and the descent is relentless. Several steep switchbacks downward before we will meet the sea. Tazacorte is pulsating with energy. Children line the street for high-fives. The announcer screams my name, my country, explaining in Spanish there are runners here from all over the world, “…TODO EL MUNDO!” he cries. Volunteers dutifully splash me with water, top off my bottles and urge me on. I feel like a superstar here, even as just another tourist. We head inland on the final climb through a deep sandy wash where few spectators linger. Several of the men who passed on the descent slow to a quiet hike, and steadily I pass each one. Only three more miles, but the climb feels severe. I am lightheaded and nauseous. We hike up the cobbled paths through the broad leaves of banana plantations and the heat reverberates strongly through my head like a bad song. Finally, we crest the climb. A man catches me in town as I barely manage a jog through the final smooth streets to the finish line. He slows for me. “Venga!” he encourages, waving me forward. I jog faster. Each time I slow, he waves me forward. I push hard to stay with him, and together we run smiling through the crowds. In the final chute we run together over a Hollywood-style red carpet lined with scores of wildly screaming spectators. The music is deafening; the announcer is rattling off accolades. We cross the finish line together and exchange a triumphant hug. Thankful, I dumbly repeat, “Gracias! Muchas gracias!” over and over for this final push. I have never had anyone reach out to me in the final stretch of a race to help me like that before. I think his kindness will stay with me forever. For a few moments, I stand awkwardly at the finish line before realizing I don’t know anyone there. A large group of superstar Americans sits talking amongst themselves, but no one I know personally. I feel relieved at my finish, but about as useless as a finisher’s medal so I collect mine and proceed to the ice baths. The finishers’ chute is a succession of luxuries for runners: showers, ice baths, massage. Everyone is treated royally and it is endearing. Another runner from Missoula, Mike Foote, wanders by recognizing me and we each share a quick recap of our race. He unfortunately had a rough day, but he seems genuinely surprised and happy for me nevertheless. His friend, Rob Krar, congratulates me on my finish and sits by my side kindly reassuring me that there is not much to do to manage the heat exposure on this course. I am humbled greatly to be sharing this experience with these two champions from back home. Their interest in my less-than-stellar performance cheers me significantly, and I realize the greatest champions are always the most graceful. Later, I learn many of the Americans did not run as well as they’d hoped. Most ran steadily, rolling with the punches, but not exactly knocking it out of the ballpark. Zach Miller and Dakota Jones finished strong in an epic battle for 4th, sprinting across the line one second apart. Alicia Shay ran a superb race and finished in 4th for women, even though it was her second ultra, and an incredibly difficult one at that. 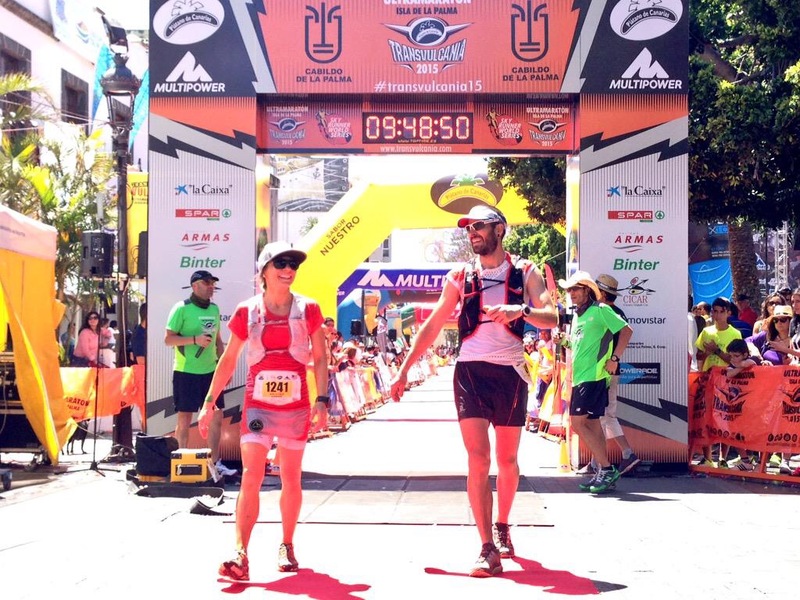 Emelie Forseberg and Luis Alberto Hernando were again crowned champions of the Transvulcania 73.3k. I finished in 6th place for women. My results show that I gradually progressed over the course of the day from 131st position overall to sixty-seventh out of 1488 finishers. Walking back to my apartment alone, soaking wet and grimy, I remember all this news will soon reach home and my friends and family will be wonderfully excited by this accomplishment. I am content. Every race is a profound lesson. 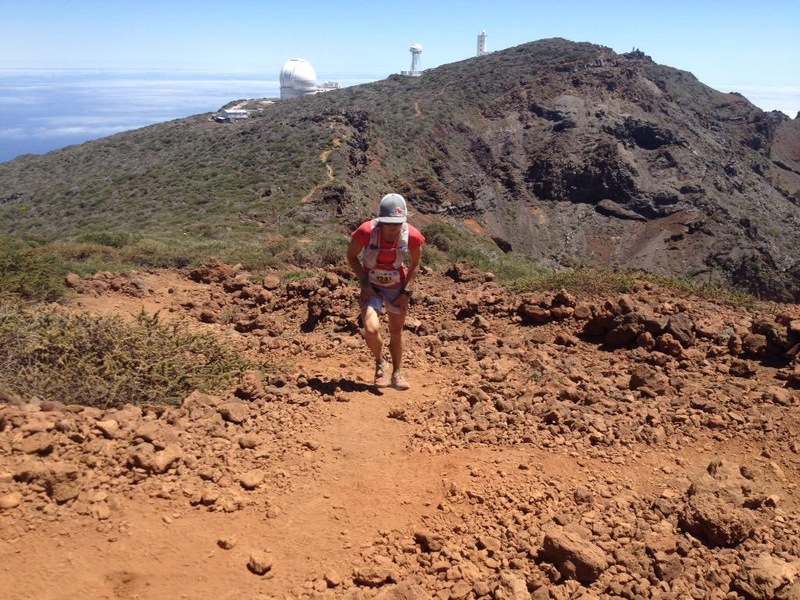 Transvulcania was one of the most challenging and humbling courses I have ever run. Mile-for-mile, the climbs were not as steep as the Rut 50k in Montana, but the ascents and descents were long and relentless. The added stressors of heat, sun, no crew, international travel, etc. all made for an exceptional experience. But I still felt reasonably well-prepared for my first international race. I owe much of this to my coach, Ellie Greenwood, who helped me immensely to prepare. Thanks so much to all of my friends and family who supported me with your kind words of encouragement, who believed in me, and who gave me your valuable advice making this race a dream-come-true. You’ll never know how much it keeps me going in the dire heat of the moment. (Especially the guys from Montana Trail Crew–your advice and encouragement were invaluable and on my mind all day–much respect). Love the writing–really immediate and gripping. Terrific story, and big congrats on finishing so well at a big deal event. Ha thanks man, you’re the best! It was a great day I’ll remember forever. Always want to do better and write shorter but it’s a learning curve! Love hearing about your adventures too. Keep’em coming!